The Giant's arms are each about four feet long. His hands have been made from a pair of (oversized) builder's gloves stuffed with bubble wrap. 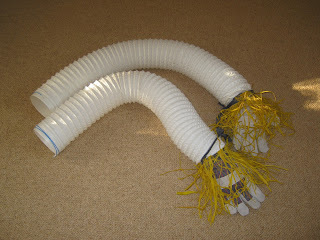 His arms have been made from two lengths of flexible, plastic covered ventilation duct. I've added some dyed raffia to his wrists to simulate straw. Once the arms are attached to the torso, they will be hidden beneath the Giant's capacious, long sleeved smock.